YF-12A is the designation of a USAF interceptor that was part of the famous Blackbird Series built by Lockheed's Skunk Works division. Only three YF12As were ever built. The design is the same as the SR-71 but the photo bays were modified to accept AIM-47 missiles and a cockpit was added for the Fire Control Officer. Two ventral fins were also added under each nacelle and a folding stabilizer fin was added under the centerline of the aircraft. The YF-12A carried three GAR9/AIM-47 missiles which could carry a 250 kT nuclear warhead. The YF-12A nose is rounded to accommodate the Hughes ASG-18 radar and Fire Control System. The ASG-18 was a combination of long range radar, and infrared search sensors coupled to a precision radar tracking system. Range of the trackers was estimated at 200 to 300 miles giving the YF-12A unprecedented ability to track and destroy enemy aircraft. The YF-12A also had similar performance specifications to the SR-71, exceeding Mach 3 and achieving altitudes over 75,000 feet. According to Gerald K. Haines, a historian for the National Reconnaissance Office, over half of all UFO reports from the late 1950s through the 1960s could be attributed to manned reconnaissance flights. Haines conclusions are based on his study of secret CIA files for an internal CIA inquiry that examined the spy agency's involvement in UFOs through the 1990s. It is not clear how Haines arrived at his conclusion. Because the YF-12A didn't exist until August 1963, his numbers must come from other aircraft types as well, most probably the Lockheed A-12 and U-2 spyplanes. 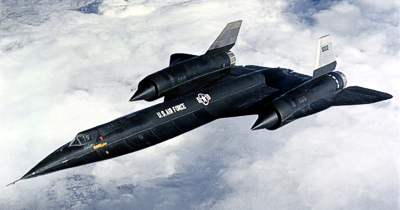 Given their uncommon appearance and the fact that they did participate in classified reconnaissance missions, it is certainly possible that Lockheed's Blackbirds could have been responsible for some UFO reports by radar operators and pilots unable to get at close look at it.